لبیبی, مهدی, لری گوئینی, فاطمه, گلشیری, علی, مختاری, محمدرضا, شعبانی, زیبا. (1396). تغییرات فلور نرمال ناحیه حلق قبل و بعد از برداشتن لوزهها در کودکان مراجعه کننده به بیمارستان مرادی رفسنجان در سال 1387. سلامت جامعه, 4(1), 20-25. مهدی لبیبی; فاطمه لری گوئینی; علی گلشیری; محمدرضا مختاری; زیبا شعبانی. "تغییرات فلور نرمال ناحیه حلق قبل و بعد از برداشتن لوزهها در کودکان مراجعه کننده به بیمارستان مرادی رفسنجان در سال 1387". سلامت جامعه, 4, 1, 1396, 20-25. لبیبی, مهدی, لری گوئینی, فاطمه, گلشیری, علی, مختاری, محمدرضا, شعبانی, زیبا. (1396). 'تغییرات فلور نرمال ناحیه حلق قبل و بعد از برداشتن لوزهها در کودکان مراجعه کننده به بیمارستان مرادی رفسنجان در سال 1387', سلامت جامعه, 4(1), pp. 20-25. لبیبی, مهدی, لری گوئینی, فاطمه, گلشیری, علی, مختاری, محمدرضا, شعبانی, زیبا. تغییرات فلور نرمال ناحیه حلق قبل و بعد از برداشتن لوزهها در کودکان مراجعه کننده به بیمارستان مرادی رفسنجان در سال 1387. 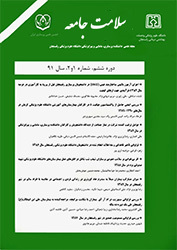 سلامت جامعه, 1396; 4(1): 20-25. Changes in pharynx flora before and after of Adeno(tonsillectomy) in children who refered to Moradi hospital of Rafsanjan during 2008. Â Background and objective: Healthy individualâs nasopharynx is colonized with several organisms. In some situations. soch as inflammation tonsils or adenoid infection, the nasopharyngeal microbial natural make up messy and opportunistic pathogens will growth more and causes upper respiratory tract infection. Tonsillectomy should be performed in this condition. This study was designed to compare nasopharynx flora before and after tonsillectomy.Â Material and Methods: In this prospective study, microbial culture obtained from pharynx of 50 Children between 3 to 8 years old with tonsillitis or adenoiditis and recurrent pharyngitis or nightly snoring candidate for Adeno(tonsillectomy). Microbial culture obtained before and at days 10th day and 30th following surgery. Data were analyzed with SPSS software.Â Results: The average of age was 5.72. 56% of children were female and 44% male. Seven bacterial species isolated before surgery that reduce to six species at day 10th and four at day 30th study. Hemophillos influenza from 28% before surgery reduced to 10% at day 10th and 3% at day 30th after surgery. Staphylococcus areus from 26% before surgery reduced to 16% at day 10th and 10% at day 30th after surgery.Â Conclusion: Adeno(tonsillectomy) is effective in reductiun of pharynx pathogens and revert to normal flora and can prevent recurrent infections of upper respiratory tract. More studies with a wider sample size and higher technology are needed for detection of differat microbial varieties..